Debbie and Alan Wagner are fans of music, especially the songs of legendary folk singer/songwriter James Taylor. And in the opening verse of his song “Secret of Life,” the couple found a name for their custom-built trawler. 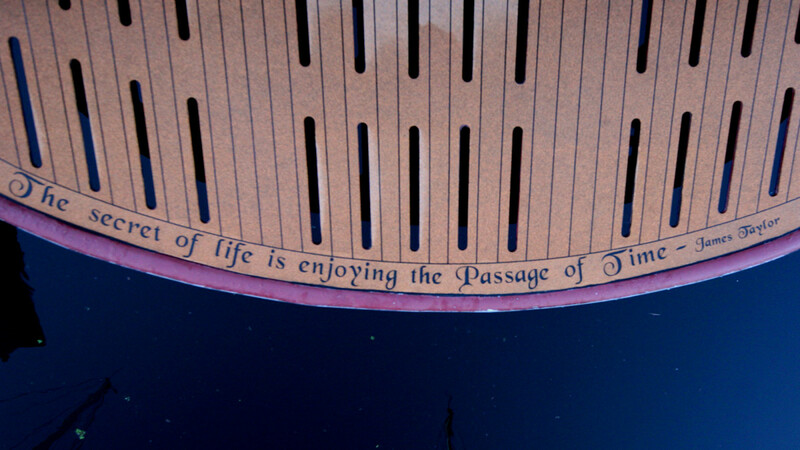 Recently they submitted their boat’s name, Passage of Time, to PassageMaker’s boat name contest. Thankfully, they also included a photograph of her. A month later, I was driving over the bridge to Davis Islands, a secluded neighborhood near downtown Tampa, Florida, to visit with the Wagners. Debbie and Alan are native Floridians, both born on the Davis Islands. Boating runs in their family, and their own first boat was a typical Sea Ray cruiser common on the west coast of Florida. It was a great starter boat for their young family, but as their son and daughter grew up they needed a larger boat. 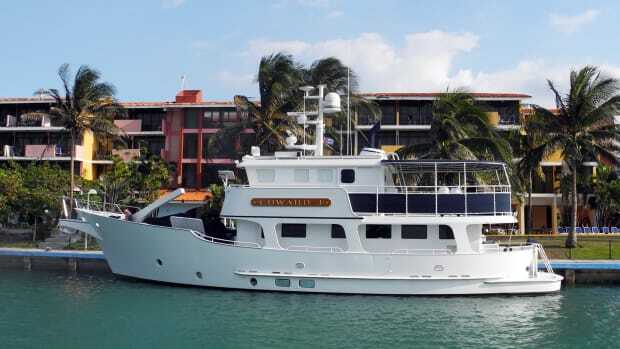 So the Wagners bought a 44-foot Gulfstar trawler in partnership with a family friend. 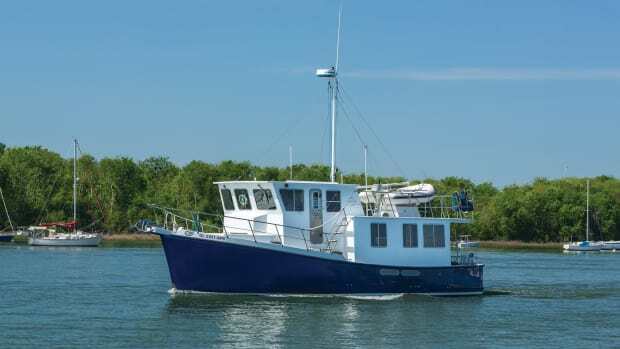 But having both a son and a daughter, they decided they would prefer a boat with three separate sleeping accommodations to facilitate privacy on longer cruises. Alan started looking for a good resource on trawler information. Fortunately, his partner was in the process of moving and was looking for a new home for his extensive collection of PassageMaker magazines. Alan gladly took the archive issues home and began reading about trawlers, starting with the original issue of the magazine from 1995. “PassageMaker became my key source of all things about trawlers,” said Alan. He found that a three-stateroom boat was difficult to find in a production boat under 50 feet, and the expense would also be formidable. So he and Debbie also began to make the rounds at boat shows along the East Coast. Along the way, Alan bought Robert Beebe’s incomparable Voyaging Under Power as well as George Buehler’s The Troller Yacht Book, 2nd Edition, which specifies the process of designing and building your own boat. Alan and Debbie began to make lists, cut photos, and sketch out the features they would like to have in their dream boat. 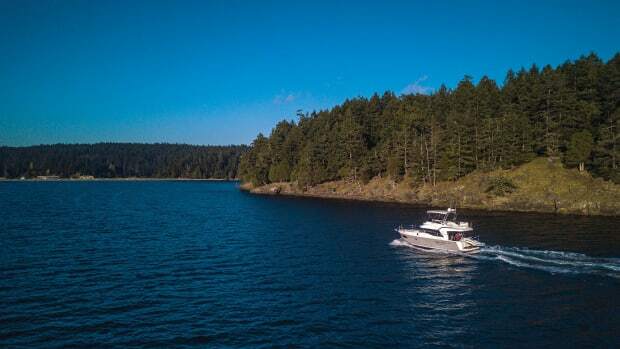 Being an experienced online researcher, Alan began a search for a yacht designer who matched the couple’s aesthetic and functional requirements. 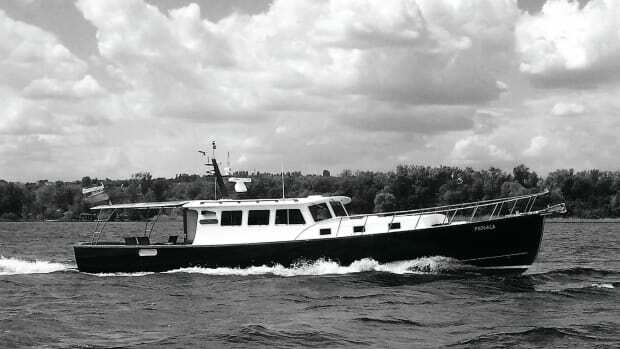 They ultimately narrowed their choice to two designers who seemed to have experience in the kind of boat they were interested in building: Michael Kasten and George Buehler, both of whom leaned towards traditional designs that incorporated long-distance displacement trawlers. They ultimately hired Kasten in April 2004, and the project began in earnest. The view from the master stateroom shows the consistency of detail throughout the custom cabinetry, all finished in natural cherry. After reviewing a number of Kasten’s previous designs, the Wagners chose to use the Valdemar 53 concept as a starting point. 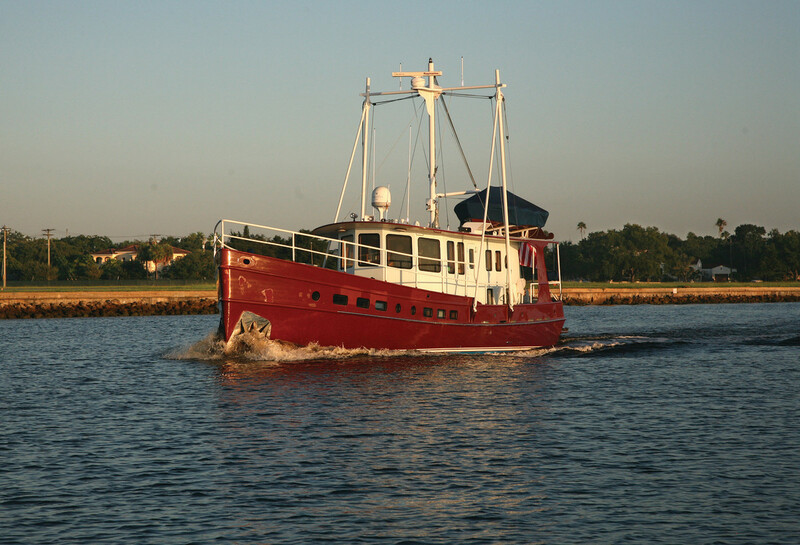 A two-stateroom aluminum trawler yacht with a private head and shower in each stateroom, the Valdemar 53 also features a large berth in the after section of the pilothouse, arranged so it can be enclosed to create a third cabin for additional guests. The aft deck provides a covered outdoor living area. Though Passage of Time is quite similar to the original Valdemar design, it is clearly a custom build. The exterior looks like the original but with the subsequent addition of outriggers in lieu of active stabilizers. The hull design also provides a full keel to protect the prop and twin canting bilge keels allowing a vertical grounding in tidal zones. The modifications to the forward interior cabin include an owner stateroom offset to starboard, a unique open saloon containing an L-shape galley to port, an extended countertop that curves into the saloon, and an especially large and comfortable L-shape settee to starboard. 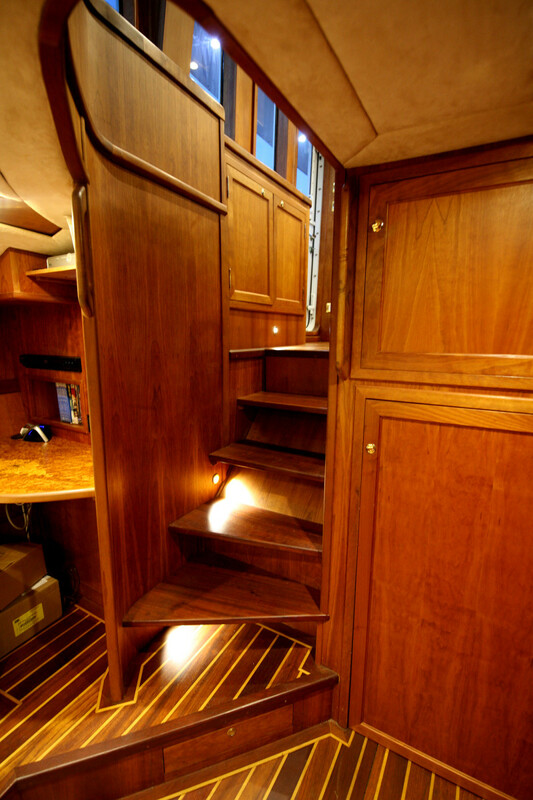 The largest head with an isolated shower is located aft of the galley making it easy to access from the pilothouse above. While the absence of a dining table is unusual, it fulfills the informal nature of the space and their lifestyle. A separate dining table is provided on the aft deck under the extended hardtop. Informal meals can also be enjoyed in the pilothouse. The unique saloon provides more space for entertaining than a traditional dining layout. 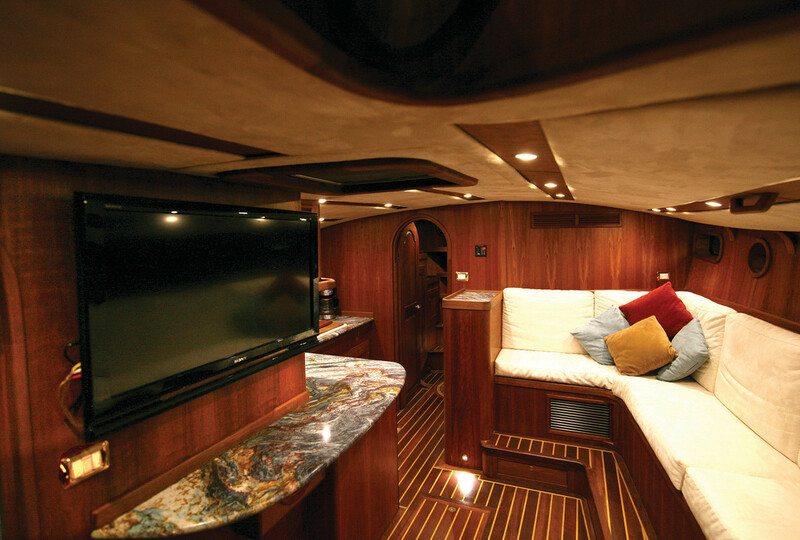 Debbie was responsible for selecting all furnishings, fabric, lighting, and appliances throughout the boat. In my opinion, one of the more outstanding features is the cabin sole made from Brazilian cherry, with contrasting maple strips. They are thick, beautiful, unusual, and seemingly require little maintenance as they looked perfect after eight years of use. All of the cabinets, wall panels, and surfaces are done in a natural cherry that has matured over the years. And the fact that one man, Steven Norton-Ashley, did all of the work himself makes the interior all the more impressive. “On Monday disaster struck. In what appears to be a freak accident, a welding spark bounced off of something, through a porthole, and into a small garbage bag that had some trash insulation inside that immediately roared into a fire that could not be contained. The smoke and flames were too much to handle. The unfinished cherry caught on fire and that was all she wrote. Passage of Time was destroyed. The complexity of the insurance settlement was managed by Alan, who, thankfully, is an attorney. The majority of the hull structure was carefully inspected, tested and was able to be reused. Work on the balance of the boat began, and the original completion date of September 2008 eventually changed to August 2010. 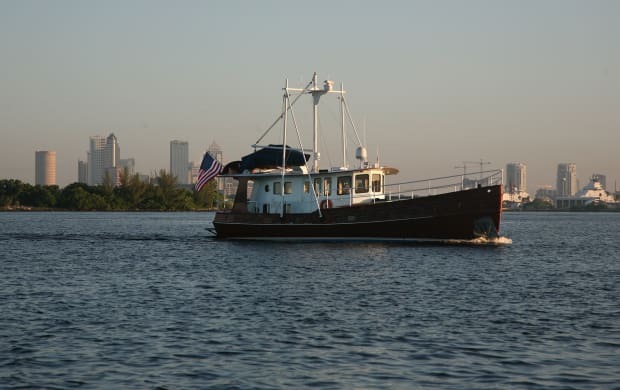 When completed, Passage of Time was delivered to Boston, then cruised by family and friends to her home port in Tampa. Originally the boat was limited in height to permit canal voyaging. Subsequent plans included a superstructure for operation of the stabilizers, dinghy launching, and communications. It is all designed to be removable if required. Our time together on the boat included inspection of the yacht and her equipment. Specifications are listed above, but one item that stands out is the propulsion system consisting of a single John Deere 6068FM 175 HP engine mated to a Freydenbro Sabb HVP 65-E transmission. A correctly sized controllable-pitch propeller is able to be efficient over a wide rpm range, and over a wide range of vessel loading. The propeller’s pitch can be adjusted as needed in order to absorb all the power that the engine is capable of producing at nearly any rpm, reducing engine vibration, noise, and eliminating cavitation entirely. Predicting ideal propeller pitch in changing conditions is far from an exact science. With the wrong fixed pitch propeller, efficiency would be very poor indeed. On our sea trial, Alan demonstrated his ability to match propeller pitch to performance utilizing a load gauge at the helm. 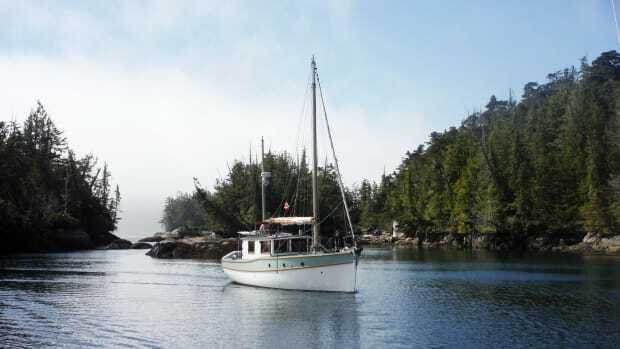 It was, however, a bit unnerving to watch him dock the boat at a steady 1400 rpm using only the propeller pitch in conjunction with the Wesmar variable-speed bow thruster to lay her gently along the dock as Debbie managed dock lines. During our test I was impressed by some of the numbers we saw. The dbA level at the helm increased by only 10% over the entire operating range. That is at or below normal conversation level, particularly impressive because the engine is directly below the pilothouse. The overall fuel burn level is excellent. The Wagners are accustomed to and enjoy a smooth, quiet ride, so the speed over the ground is very acceptable. It appears the target range is well within reach. 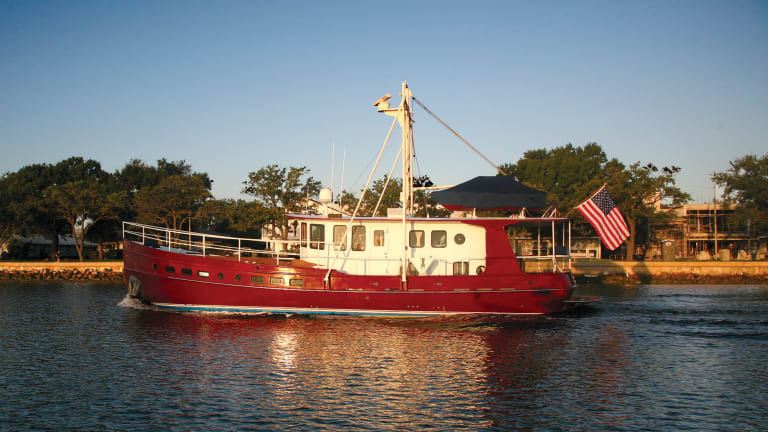 The Wagners, who had originally hoped to retire by now, have taken advantage of some ensuing business opportunities and have been limited to short-distance cruises in Florida and the islands. I hope that soon Alan and Debbie will be able to take the time to truly enjoy the Passage of Time. Note this article has been updated to correct Debbie Wagner&apos;s name in the third paragraph where it was written as Denise. Also, the author of Voyaging Under Power is Robert Beebe, not Alan Beebe.